Personal Injury | J. Boyce Garland, Jr. According to the Centers for Disease Control, unintentional personal injuries claim more lives among people aged 1 to 44 than any other cause. More young people die from injuries than cancer, heart attacks, or congenital illnesses. Every three minutes in the U.S. a person dies as a result of personal injury. Car accidents, falls, and recreational injuries take the lives—and change the lives—of many individuals in North Carolina every year. Injuries take place on the road, at home, at playgrounds, at nursing homes, and at business establishments. Every year, personal injury attorneys see countless cases where individuals were needlessly injured due to another person’s carelessness or negligence. Many personal injuries are highly preventable. For instance, playground injuries send approximately 200,000 children to the emergency room every year. Day care centers have a duty to protect child play areas to mitigate the impact of a fall. Proper supervision around playgrounds and stairs is also important. Elderly nursing home residents are also at risk of being seriously injured as a result of a slip and fall. Older adults who suffer slips and falls may face hip fractures, traumatic brain injury, and may be at risk of early physical decline and death. Car accidents also account for a large number of the personal injuries that claim lives and result in extensive medical treatment. According to the National Highway Traffic Safety Administration, in 2010, 2.24 million people were injured in car accidents in the U.S. These injuries may require months to years of medical care, rehabilitation, and may result in victims missing time at work, or result in lost productivity. Individuals who have suffered personal injuries have the right to seek compensation from negligent parties for their losses. If you believe that you or a loved one was injured due to premises liability, improper care or supervision at a nursing home or day care, or due to another driver’s carelessness, recklessness, or negligence, you may be entitled to money for your injuries and pain and suffering. 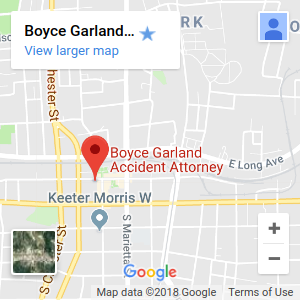 J. Boyce Garland Jr. is a personal injury lawyer in Gastonia, North Carolina. Our firm works closely with injured individuals and their families to ensure the best possible outcome under the law. According to the Centers for Disease Control, of the 200,000 children who visit the emergency room for playground injuries, 45% of these injuries are severe. Fractures, internal injuries, traumatic brain injury, and amputations can occur when children hurt themselves on playground equipment. Many injuries take place when children are entrusted to the care of daycares and schools. Daycares and schools are responsible for maintaining playground equipment that is safe. Childcare workers have a duty of care to watch children while they use this equipment. Playground injuries cost parents and communities over $1 billion in 1995. If your child has suffered a fall or injury, you may be entitled to compensation to help you pay for medical care and rehabilitation. Parents may have to miss time at work to care for a hurt child. If your child was injured at a playground or daycare, you have a right to seek justice and hold caregivers accountable. Contact J. Boyce Garland, Jr. Attorney, an accident lawyer in Gastonia, North Carolina. Older adults are particularly vulnerable when it comes to slip and fall dangers. A fall that a younger person can sustain without serious injury can require extensive rehabilitation for an older adult. Businesses and property owners have a duty of care to foresee potential safety hazards and warn individuals about these hazards. If a hazard could have been reasonably repaired, individuals who are injured due to the hazard may have the right to seek compensation for their injuries. Nursing homes also have a responsibility to protect residents from injury. Falls can be prevented in nursing homes if caregivers help older residents stay active and fit. Some medicines can make older Americans more prone to falling. Caregivers and doctors should take proper measures to warn individuals about their risk and mitigate the risk. Nursing homes can eliminate tripping hazards by keeping walkways and rooms clear. In bathrooms, rails and holds can help older adults avoid slips. If you or a loved one has suffered an injury in a nursing home or due to a property owner’s failure to maintain a safe premises, you may be entitled to money for your injuries and pain and suffering. An injury lawyer can review the details of your case, determine the value of your claim, and help you move forward with a claim. J. Boyce Garland, Jr., Attorney, is a personal injury lawyer in Gastonia, North Carolina serving older adults and their families. Find Me An Injury Lawyer in Gastonia, N.C. If you’ve been injured in Gastonia, North Carolina, you may have many questions. You may be facing high medical expenses and may not be able to work. You may wonder whether you have a personal injury claim and wonder whether an accident lawyer can help. J. Boyce Garland, Jr., Attorney offers caring and compassionate counsel to accident victims and their families. Contact the firm today for a free, initial, no obligation consultation. For information on accident law, click here.